Our mission is to find permanent, caring homes for the cats and dogs in our care; to reduce the number of unwanted litters by educating the residents of Churchill County on the importance and benefits of spaying and neutering; to rescue adoptable cats and dogs from Fallon Animal Control; and to educate the public on companion animal welfare issues and alternatives to cat and dog surrender. HOURS OPEN TO THE PUBLIC: TUESDAYS, WEDNESDAYS, FRIDAYS AND SATURDAYS FROM 10 AM UNTIL 2 PM. The Churchill Animal Protection Society (CAPS) is a small, nonprofit, no-kill animal shelter located in Fallon, Nevada. CAPS has served the residents of Churchill County since August 1986. CAPS is a registered 501(c)(3) that rescues and adopts dogs and cats to good homes. We make sure they are healthy, vaccinated, and spayed or neutered before they leave. We do not adopt out puppies and kittens under the age of 6 months to families with children under the age of 5 years. Person(s) adopting a dog from our facility must have a 6-foot fence or a secure outside kennel. We do not adopt out our dogs to person(s) who intend to tether the dog. All cats adopted from our facility must be an inside-only family member. Since June 2005 we have offered low-cost spay-and-neuter programs through grants, our own fundraising, or through generous benefactors for low-income Churchill County residents who qualify. Combined with our in-house spaying and neutering, we have altered close to 2,000 dogs and cats. The dogs have inside-outside kennels. While their kennels are being cleaned, they get to socialize with other dogs in play yards. On the days we are open to public (Tuesday, Wednesday, Friday, and Saturday from 10 a.m. to 2 p.m.), they are walked by our volunteers. This year we completed an exercise yard that allows the volunteers to let the dogs off leash before or after their walks to play fetch, dip in the pool (during the summer), or just sniff around. Every Tuesday and Friday, we alternate the dogs and take them to our local doggie daycare for a fun day of socializing and time away from the shelter. Our cats are housed in floor-to-ceiling condos with scratchers and ledges. A schedule posted on our cat room door lists the cats who are to be let out of their condos after the shelter closes so that they can stretch their paws in the cat room. We also have a separate quarantine room for cats who are brought into the shelter but have no shot history or for pregnant cats who are ready to give birth. 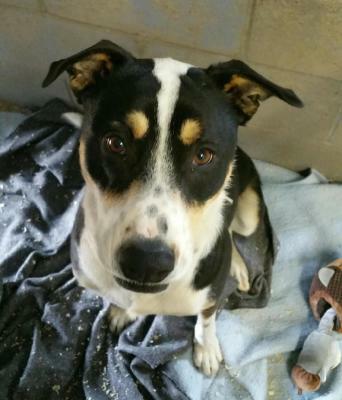 Paisley is a 3 year old Dutch Shepherd/Heeler mix. Eleven (or Dixie) was originally a puppy from CAPS. She was one of a litter of 9 puppies last January. Eleven is now 1 year old and the sweetest girl who loves to run, play, eat treats and long walks. She would do better with male dogs. 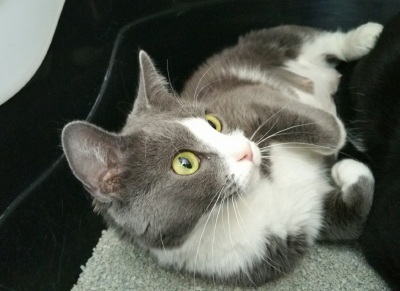 Eleven is looking for a loving forever home. Come on down to CAPS and let her conquer your heart! Fancy is a 2 yr old DSH playful girl. Fancy came to us with her son Oreo. She is very outgoing and friendly. She loves people, cats and dogs. 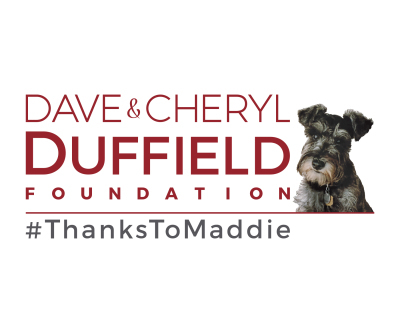 "The gererous founder of Dave & Cheryl Duffield Foundation and Maddie's Fund! ​​Walmart Day Kissing Booth April 6th 2019- come on down and smooch a pooch!!! We are there to bring awareness to CAPS and to advocate Spaying and Neutering. So come on out and donate to CAPS for this worthy cause! All donations are tax deductable! Just ask for a receipt. See you there!